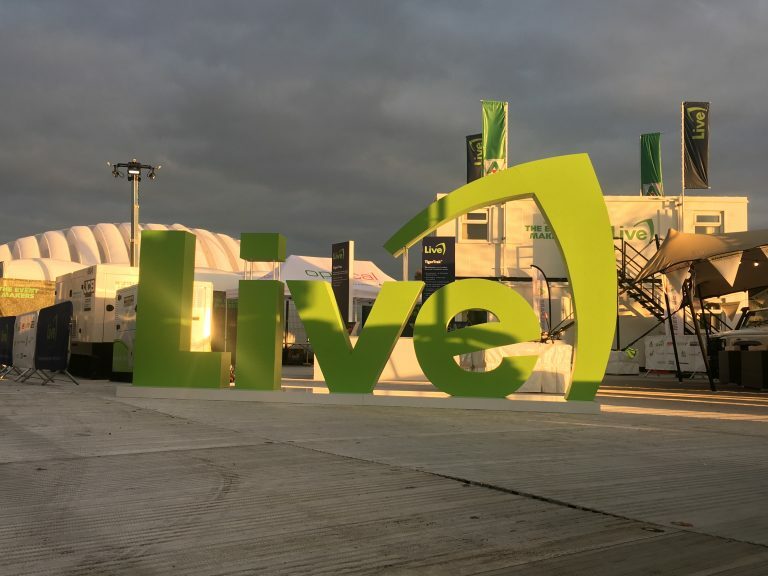 Earlier in the year, our exhibitions team have been delivering Live’s stand at the Showmans Show for A-Plant. 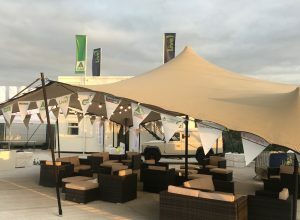 The Showman’s Show is the UK’s most comprehensive exhibition of products, services and entertainment for the festival, outdoor and special event industry. At the setting of Newbury Showground, Berkshire, expecting to attract an average of 4000 visitors over the two days. 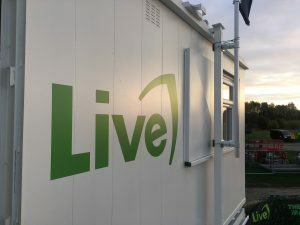 Live (a division of A-Plant) is the market leader in temporary ground access and crowd control solutions, developing, hiring and installing; temporary roadways, pedestrian walkways, pitch protection, car parks, bridges, barriers and fencing. 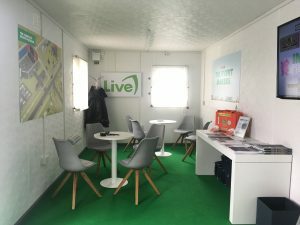 Over the past two years, Live has been a key exhibitor at The Showmans Show – an event geared towards outdoor event professionals where the focus has been on creating a social area for meeting people, but also create opportunities for potential prospects to better understand Live products and services. In addition, other A-Plant divisions have also had a smaller presence. 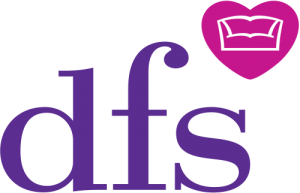 Fresh was required to devise a solution that effectively encompassed the above but also provide the audience with a memorable welcoming experience and an increased ROI for Live. 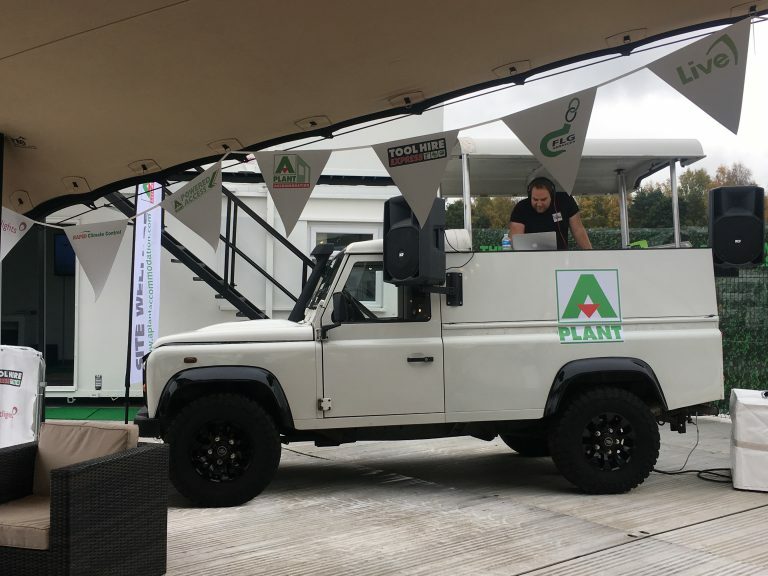 By showcasing A-Plant’s products in the exhibition area in a more creative manner than previous shows, all products were surrounded by a lively and engaging festival theme, made complete with stretch tent, lighting, bunting, large festival lettering, live music from a DJ truck as well as hot drinks and food from the catering truck! 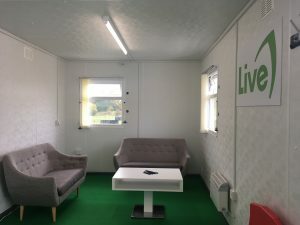 We also dressed the exterior of the accommodation units with graphics & flags, as well as fitting out the interior with carpet and furniture. 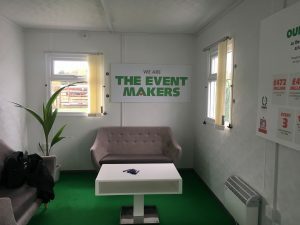 The lower accommodation unit was focused on their new campaign “We are Event Makers”, and the upper unit as a VIP area, serving cold drinks and offering quieter meeting spaces for any needed sales conversations. 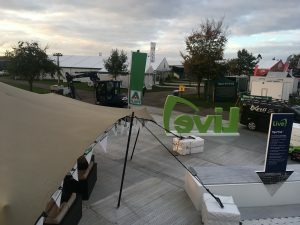 Any large exhibition project has very complex logistics with many continuously moving and evolving parts. 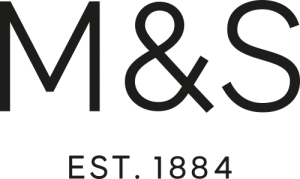 On this project, we were heavily involved in co-ordinating numerous internal client suppliers from across the UK as well as manage a number of external suppliers and contractors to ensure a smooth delivery onsite. 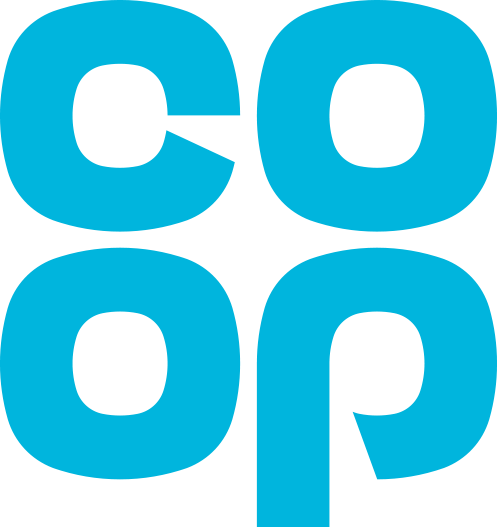 We delivered something that was completely different to anything the business had done before. 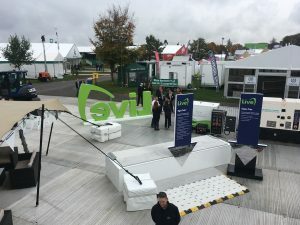 We received some fantastic feedback from both Live, A-Plant and the other divisions showcasing on the stand.